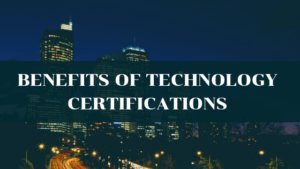 Why Should You Get Certified in Technology? The question everyone asks before they commit to training… do I really need this certification? Some of you may be required by your employer. Some of you may want a leg-up in the hiring process. But what is the true benefit of having a certification in the technology industry and which one is right for you? Shows Commitment: Earning a certification is a great way to prove dedication and commitment to your career. By investing in yourself, you are adding value to your company and ultimately enhancing your job retention. Increased Salary: Higher pay is always a bonus. According to Forbes, the average salary of the top 15 highest paying IT certifications is over $108,000, about 21% more than the average salary of an IT professional. Obtaining a certification will likely pay off in the end. Promotions: Not only do certifications help you land a job, but promotions within your job are more likely. To earn a promotion, you need to know the newest technology available to justify why you deserve the advancement. Microsoft confirms that 91% of managers consider certifications in the hiring process. Not only that, but certified employees make about 15% more than their associates. Technology certifications can greatly benefit your short-term and long-term career goals. Professional Credibility: Certifications demonstrate dedication to professional development. Whether you’re trying to earn that promotion or land an interview, what employer wouldn’t want someone with proven expertise in their desired technology area? Cisco – Cisco offers many certifications in the technology industry. About 75% of managers will say that Cisco certifications increase team performance. Better performance results in higher job satisfaction and compensation. Red Hat – Red Hat is a tool that allows companies to align their IT and business strategies. Over 90% of Fortune 500 companies use Red Hat. IT professionals are using this technology to improve their job efficiency and productivity. In fact, 84% of Red Hat Certified Professionals say their certification has helped them in their current position. Big Data – Big Data is a broad topic that covers a lot of material. These are widely sought-after skills since there were over 26,000 open positions advertised in the last year. Hiring managers value Big Data certifications when judging candidate expertise. Juniper – Juniper certifications give customers the opportunity to take multi-tiered tracks, meaning you can demonstrate skills that are most relevant to your job role. With niche skills you learn in Juniper classes, you are instantly more valuable to employers. Our instructors are certified to train individuals in many different technologies including Cisco, Red Hat, Juniper, Big Data and more. We also have testing centers in our Denver, CO and Reston, VA facilities, allowing you to learn and earn your certification in the same place! 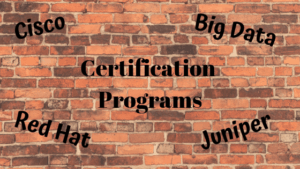 Check out the list technologies we teach, along with the certifications tied to them, and decide what is best for your career goals.